Enjoy my tutorial :) You must have working knowledge of Corel Paint Shop Pro X2 or newer Okay Ready, set, GO! Open a 650 x 250 new canvas, For this tutorial, I used two things, my jasc animation program, and used only one type of effect, that's not a plug-in, and you can pretty much get this effect with either corel, or with Photoshop. I simply used Radial blur. You can find this function under your Adjust tabs next to Effects. First things first is Duplicate your scenery layer that's apart of your tubes background, if you don't have one you can make up one you like and just go from there, pretty much any background will work depending on your choice of tube. For instance I'm using Alena art, which works really well in what I am about to do for my animation process. So Duplicate your layer 3 times. Next you will be applying Radial Blur to each... Here's a sample of what I did, all you have to do is adjust the "strength" numbers (I circle it in red for you), I went from 15% up to 45%. Which ever percentage you like just increase it by 10-20% from your first layer. I choose my first duplicate at 15%, my second duplicated 35%, and my last duplicated layer 45%. Now here, before you copy and paste these layers to your animation program, you will want to make your border for your banner, and also don't forget to add your name, your copyright info, and of course your license if your using a PTU tube. *Now for this next step I opened up my Jasc Animation Shop. 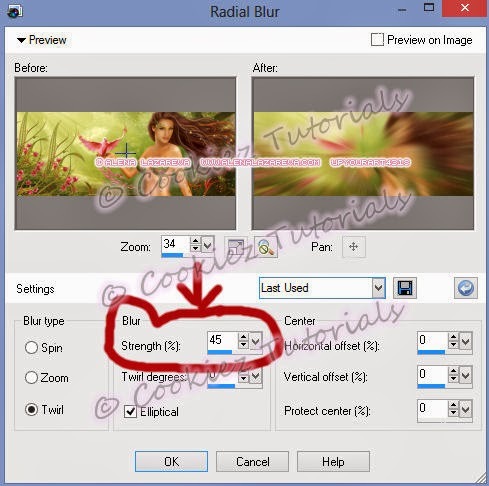 Copy each of the 3 duplicated layers that you now have applied the radial blur effects to. Select the transition effects option, from there you pick FADE.- Leave everything as is, don't adjust layers or frame, and click OK . Then save your animation as GIF.